In Persuasion Nation is Saunders’ third published short story collection and my second foray into his works. 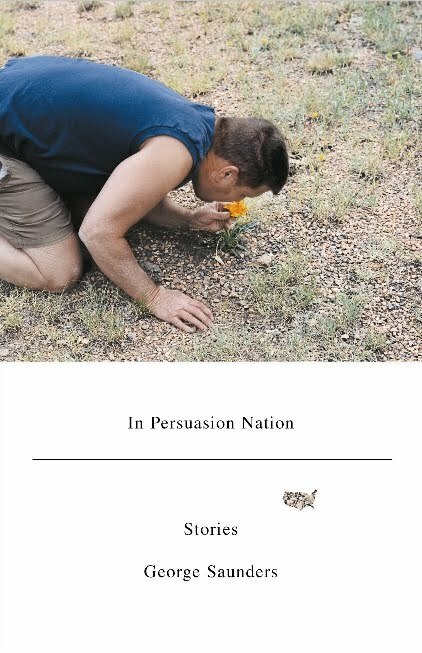 Originally published in 2006, it collects his short fiction from The New Yorker, Esquire and Harper’s, but, as with CivilWarLand In Bad Decline, there is a unifying theme. In the first, it was the mundanity and inhumanity of American working life, the petty abuses of bosses and middle management; here, it is the ubiquity of advertising, re-imagined to be more intrusive and predictive but no less inhumane in its methods and aims. The familiar Saunders elements are all here: imaginative dystopian worlds, caustic wit and an endearing empathy for our most human elements. But there is also a growing sense of maturation, a willingness to tone down the humor in favor of pathos and in service of greater aims than mere satire. In “The Red Bow,” perhaps my favorite of the bunch, Saunders eerily charts the descent of a small town into tyranny as a rabies-like infection makes the town’s pets vicious and uncontrollable. The tragic death of a young girl by a rabid dog and her father’s ensuing grief become catalysts not for greater empathy and compassion but a fanatical vigilante movement that abandons temperance, proportionality and reason in favor of assuaging their bloodlust and quelling their fears. The usurpation of tragedy to serve darker purposes and silence reasoned debate is a timeless theme in human history (consider 9/11), and it is chilling to watch Saunders slowly ratchet up the tension and subtly chart the descent into totalitarianism. I continue to be deeply impressed by Saunders. For his control of the short story form, his imaginative plots and verbal dexterity, he can be justly placed alongside William Trevor as a contemporary master, someone who simultaneously demands our attention with what he has to say and rewards us for how he says it.